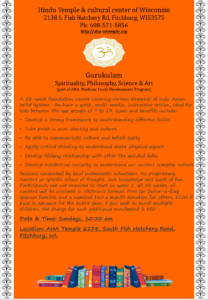 American Hindu Association (AHA) is proud to announce the launch of Gurukulam Program for kids starting from Jan 6th 2019 at AHA temple. If you are interested in enrolling your child(ren) please use the following signup form. The program will be held on every Sunday (starting on Jan/62019) at 10:30 AM at the temple.